Heroic captain "Sully" Sullenberger has written a new book, in which he praises several Americans he perceives as heroes. Included in his list is former DC Schools Chancellor Michelle Rhee. Firstly, I'm somewhat stunned that this former pilot is an authority on education. For one thing, he hasn't got as much money as most "experts," like Gates, Broad, or Rhee Herself. I'm trying to recall the last time a teachers were queried for their opinions on landing planes. Nothing comes to mind, and for that I'm grateful, as I have no idea how to do so. I'm afraid I put as much faith in Sullenberger's notions of education as my own on aviation--which is to say none whatsoever. Things are tough for pilots nowadays. It's tough for them even to get by. 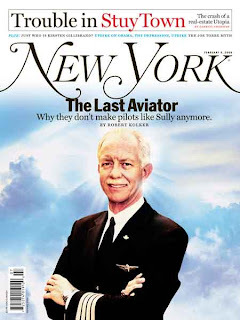 Sullenberger himself has been active in trying to improve conditions for pilots. It's ironic that he fails to see that what Rhee wants to do to teaching is precisely what corporations have done to the profession he loves. It's preposterous to look to Rhee as a role model for anything other than union-busting. Here's a woman with the audacity to chuckle over amusing stories about taping her students mouths shut, and tell tall tales about her own teaching record. Personally, with all the talk of bad teachers, I fail to see how someone like Rhee was not fired for physically assaulting young children. But that's just me. Sully's a hero, but in this case he has no idea what he's talking about. Unless he believes it's a good thing to have teachers fired for no reason, to make no progress in supposedly all-important test scores, or to be embroiled in scandal over their falsification, it's tough to see what makes Rhee a hero. Rhee is part of a national movement to scapegoat teachers for shortcomings that do not exist. If Sullenberger wants to know how to really improve schools, he ought to study what's happening in Finland, and follow a model that actually works. Otherwise, it kind of behooves Mr. Sullenberger to refrain from pontificating on topics about which he knows nothing. I won't pretend I know how to fly a plane and endanger the lives of my passengers. Mr. Sully ought to show the same consideration to American teachers and students. As things stand right now, he's actively contributing toward crashing public education to the ground. What Do You Mean It Isn't Summer Yet? Where Do Troubled Kids Go in the Summer?